This is what happens, you go into a world of inflation in financial assets after the terrible world of inflation in consumer prices, wages and everything. That more or less has been on since you had a rise in commodities up until 2008, when the price of crude got up to $147. With the change in the credit markets, like the yield curve and credit spreads, it has been dramatic enough that some big players somewhere are probably offside, but there has not been announcements of insolvencies. So, the changes in the markets, are perhaps dramatic enough that there should be big players offside, but perhaps they are just holding it all together until the markets are tested yet again. The bubble was a classic and the transition to the contraction has been on the path but with the distinction that there has been no major disasters reported yet. 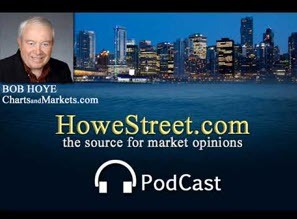 Hoye's methodology indicates that the markets were oversold at Christmas and are overbought now. Canada should be allowed by the government in Canada to transport energy as most efficiently as possible from where it is to where it isn't. People are power poverty stricken. People cannot afford to heat their homes. Hoye warns that if the UK gets another cold spell, it could have tragic consequences. Hoye ends by reminding everyone about the dire predictions from global warming guru James Hansen that the summers in the Arctic would be free of ice by now, but that is not the case.